The Bosch Rotak 43 Ergoflex is a high quality cordless lawn mower which provides excellent cutting performance, and at the same time it’s also very comfortable and easy to use. The ergonomic design of the lawnmower’s handlebars puts the user’s wrists/hands in a neutral position, which in turn minimises chances of any stress related discomfort. 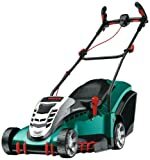 The Bosch Rotak 43 Ergoflex cordless lawn mower features innovative air flow technology, and a very hardened steel blade which has Leafcollect function. For an even more simplified mowing, it features a great new Powerdrive+ system which delivers high torquet. The Bosch Rotak 43 has a large 43 centimeter rotary cutting steel blade and two batteries. It features 10x adjustable height, cutting options ranging from 20mm to 70mm, and has a capacity of 50L grass box. Like all the Bosch Rotak lawnmowers, it basically comes partly disassembled but it is quick and easy to assemble or put together. grass a simple chore. In case you happen to hit a rough or tough piece of the lawn, the mower motor senses it, and responds accordingly by increasing torque which in turn makes it easily glide through with much ease. The steel blade is driven through the automatic gearbox which ensures a steady 3600 rpm blade speed. This enables the lawnmower to make short, easy work of even the dampest of grass, which could otherwise easily clog the mower blades, results into frustrating starts and stops in order to clean the blade. 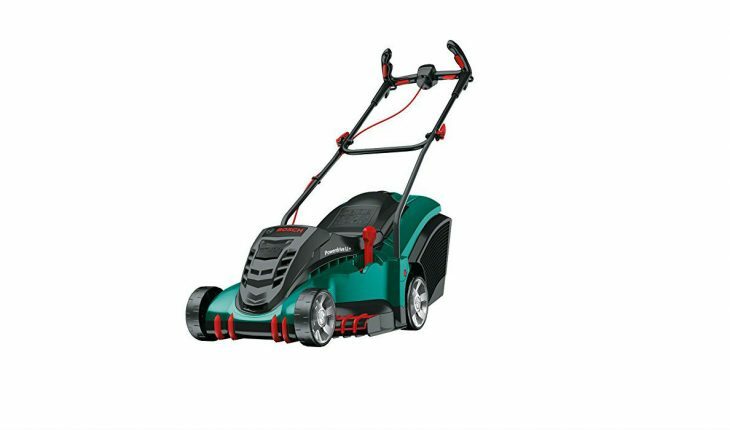 The Bosch Rotak 43 Ergoflex light weight build (13.1kg), ensures that even the heavier workloads do not become tiring, thanks to its’ smooth running, rubber coated wheels which offer great maneuveurability when negotiating the tricky lawn borders. In addition, it has the AGR certified Ergoflex System handlebar which has been designed for added comfort, convenience, and enhanced working posture which helps reduce muscle strain as you work. It offers an outstanding cutting performance along with debris collection thanks to its’ hardened steel blade, and the innovative air flow technology. It has outstanding ergonomics, thanks to the Ergoflex handlebars with AGR certificate. It comes with great grass combs, an integrated rear roller, and an automatic safety cut out. It has foldable handles for much easier storage. It has a powerdrive+ system motor which ensures a more reliable cut, even during difficult circumstances. It is equipped with a powerful 1800W powerdrive motor which offers a quiet, fume free and effective service. It features Bosch’s new Quickclick handle system for a straightforward, tool free initial assembly, and great convenience. It has ergonomic handles for comfortable and easy handling. It has a 50 litre grass box capacity which reduces interruptions required for emptying. The LeafCollect function ensures exceptional easy collection of leaves. It is sturdy and very well built. It offers great cutting performance on all conditions including long, short, tough and damp grass. It’s a very convenient and highly powerful electric rotary lawn mower. Its’ ergoflex handlebars allow for an easy, effortless control, an enhanced posture, whilst reducing muscle strain when mowing. It is quite light for its’ size which makes it very maneuveurable. The lawnmower is quiet, fast and powerful. The build quality may feel a little flimsy, however that’s to keep it sturdy and lightweight. You have to read the instructions otherwise some parts of assembly may seem difficult to handle. The Bosch Rotak 43 LI Ergoflex offers great value for money. It is an easy to use, comfortable and intuitive electric cordless lawnmower. It offers great performance on the long, short, tough and even damp grass. The Bosch Rotak 43 is a really fantastic lawnmower which delivers great cuts, is easy to maneuveur due to its’ lightweight design, and delivers quick, effective cuts whilst ensuring that all cut grass is properly kept inside the grass box. This lawnmower is quite ideal for anyone who wants a light weight, high quality mower which offers exceptional performance. Buy yours today, and start enjoying the many benefits it offers.